UNIVERSITY COLLEGE LONDON—Neanderthals have been imagined as the inferior cousins of modern humans, but a new study by archaeologists at UCL reveals for the first time that they produced weaponry advanced enough to kill at a distance. The study, published in Scientific Reports, examined the performance of replicas of the 300,000 year old Schöningen spears – the oldest weapons reported in archaeological records – to identify whether javelin throwers could use them to hit a target at distance. The javelin athletes demonstrated that the target could be hit at up to 20 meters, and with significant impact which would translate into a kill against prey. This is double the distance that scientists previously thought the spears could be thrown, demonstrating that Neanderthals had the technological capabilities to hunt at a distance as well as at close range. Dr Matt Pope (UCL Institute of Archaeology), co-author on the paper, said: “The emergence of weaponry – technology designed to kill – is a critical but poorly established threshold in human evolution. *Annemieke Milks, David Parker & Matt Pope. ‘External ballistics of Pleistocene hand-thrown spears: experimental performance data and implications for human evolution’ is published in Scientific Reports on Friday 25 January 2019. 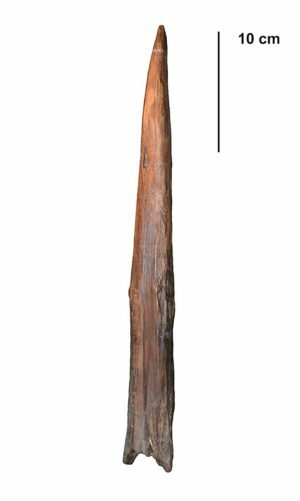 If you liked this article, you may like Spears of the Ancient Huntsman, a free premium article published previously by Popular Archaeology.